We all have one person who recommend us a book, a writer or a genre. ‘Have you heard about x,y or z writer? You should read his/her book. It’s amazing.’ With that simple sentence our brain starts working. The consequence? We will try that author, book or genre. That person in my life is my sister-in-law. For the last eight years, she has been recommending books and I have to admit, 95% of the times she has been spot on. 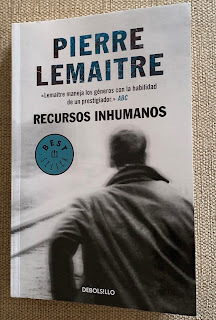 It must be around four years ago, when we were talking abut thrillers and she was so enthusiastic about a French writer called Pierre Lemaitre. Honestly, before that day I never had heard of him. But she spoke so highly about one novel (Alex) that I bought it stratight away. I loved it! Simply phenomenal! Then I read another three of his books, same result, fantastic! Last January, I went to visit them back home in Spain. As usual, she recommended me another book, Inhuman Resources. I have mixed feelings for this one, I liked it but I didn’t loved it. It’s well written, characters very well crafted but some parts of the storyline bored me. Some parts are just not credible and some turns are just ‘too Hollywood’, but again, I have enjoyed it and I would recommend it. I enjoy talking about politics, I have my views on things which I don’t pretend to be right, just have them and I respect any contrary opinion. Fine with that, but on this particularly novel his turns against capitalism are ludicrous and populist. Obviously, companies want to maximaze profits and shareholders get more money in bonus than workers but capitalism is not the devil. Is it improvable? Yes! Is it perfect? No. Pierre Lemaitre hits the fan against it too often and in situations that were avoidable but in a sense it’s understandable. The main character, Alain Delambre, is an outcast. He was an executive in a big corporation, his company merged with a foreign one and he was made redundant. As he’s over 50 he can’t get back to the job line and has to work in underpaid jobs. That hit him up to the point of depression, humiliation and his self stem is down to the floor. When a situation gets worse, he had an interview that could change his and his family life. Sadly, he discovered that he has been played out and he had zero chances to get it. At this point he starts creating a net of lies, deceit, wrongdoing that will make him fall. This is a tale of frustration against a society, corporativism and modern economy where profit beat humanity, and Lemaitre made it easy to understand and follow. No doubt I would recommend ‘Inhuman Resources’ but don’t expect to its reading will change your life. From 1 to 10, I would give this a 7. Have you read it and you disagree with me? Fantastic, let’s chat about it leaving a message below.